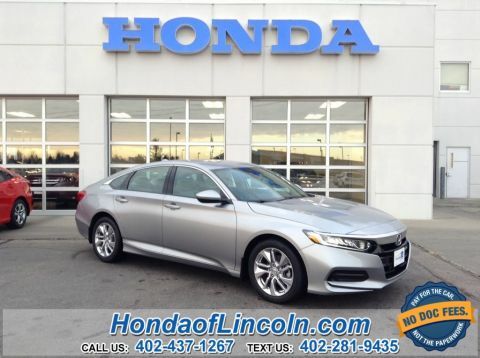 2019 Honda Accord LX FWD 1.5T I4 DOHC 16V Turbocharged VTEC Gray w/Cloth Seat Trim, Alloy wheels, Automatic temperature control, Distance pacing cruise control: Adaptive Cruise Control with Low-Speed Follow, Electronic Stability Control, Exterior Parking Camera Rear, Fully automatic headlights, Illuminated entry, Low tire pressure warning, Steering wheel mounted audio controls, Traction control. Discover the difference. Experience the value. Honda of Lincoln. 2019 Honda Accord LX FWD 1.5T I4 DOHC 16V Turbocharged VTEC Black w/Cloth Seat Trim, Alloy wheels, Automatic temperature control, Distance pacing cruise control: Adaptive Cruise Control with Low-Speed Follow, Exterior Parking Camera Rear, Fully automatic headlights, Illuminated entry, Low tire pressure warning, Radio: 160-Watt AM/FM Audio System, Steering wheel mounted audio controls. Discover the difference. Experience the value. Honda of Lincoln. 2019 Honda Accord LX FWD 1.5T I4 DOHC 16V Turbocharged VTEC Gray w/Cloth Seat Trim, Alloy wheels, Automatic temperature control, Distance pacing cruise control: Adaptive Cruise Control with Low-Speed Follow, Electronic Stability Control, Exterior Parking Camera Rear, Fully automatic headlights, Low tire pressure warning, Radio: 160-Watt AM/FM Audio System, Remote keyless entry, Steering wheel mounted audio controls, Traction control. Discover the difference. Experience the value. Honda of Lincoln. 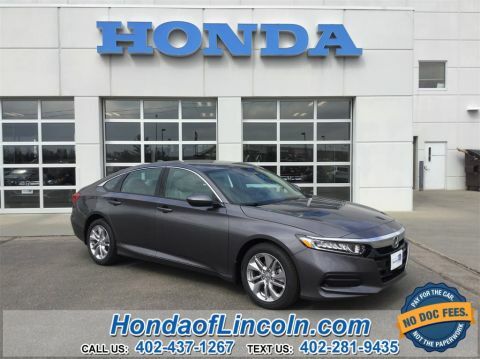 2019 Honda Accord LX FWD 1.5T I4 DOHC 16V Turbocharged VTEC Gray w/Cloth Seat Trim, Alloy wheels, Automatic temperature control, Distance pacing cruise control: Adaptive Cruise Control with Low-Speed Follow, Exterior Parking Camera Rear, Fully automatic headlights, Low tire pressure warning, Radio: 160-Watt AM/FM Audio System, Steering wheel mounted audio controls, Traction control. Discover the difference. Experience the value. Honda of Lincoln. 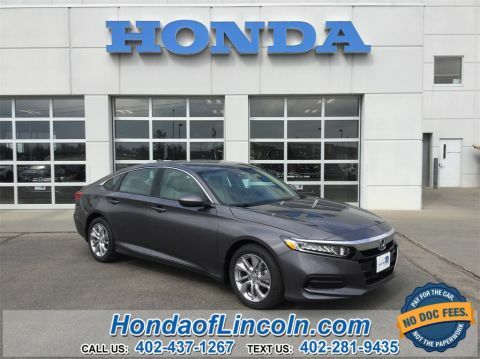 2019 Honda Accord LX FWD 1.5T I4 DOHC 16V Turbocharged VTEC Gray w/Cloth Seat Trim, Alloy wheels, Automatic temperature control, Distance pacing cruise control: Adaptive Cruise Control with Low-Speed Follow, Exterior Parking Camera Rear, Fully automatic headlights, Low tire pressure warning, Radio: 160-Watt AM/FM Audio System, Steering wheel mounted audio controls. Discover the difference. Experience the value. Honda of Lincoln. 2019 Honda Accord LX FWD 1.5T I4 DOHC 16V Turbocharged VTEC Black w/Cloth Seat Trim, Alloy wheels, Automatic temperature control, Distance pacing cruise control: Adaptive Cruise Control with Low-Speed Follow, Exterior Parking Camera Rear, Fully automatic headlights, Low tire pressure warning, Radio: 160-Watt AM/FM Audio System, Steering wheel mounted audio controls. Discover the difference. Experience the value. Honda of Lincoln. 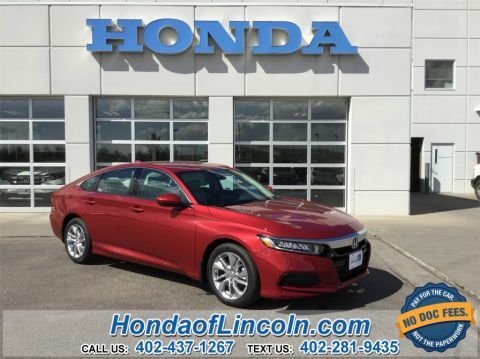 2019 Honda Accord LX FWD 1.5T I4 DOHC 16V Turbocharged VTEC Gray w/Cloth Seat Trim, Alloy wheels, Automatic temperature control, Distance pacing cruise control: Adaptive Cruise Control with Low-Speed Follow, Exterior Parking Camera Rear, Fully automatic headlights, Radio: 160-Watt AM/FM Audio System, Steering wheel mounted audio controls. Discover the difference. Experience the value. Honda of Lincoln. 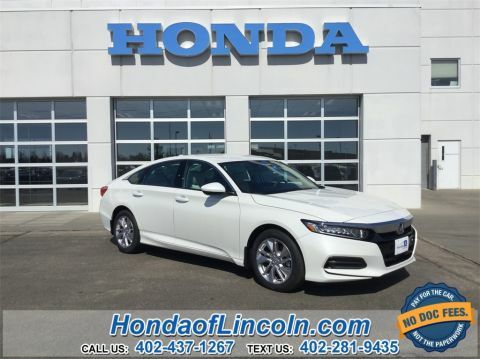 2019 Honda Accord LX FWD 1.5T I4 DOHC 16V Turbocharged VTEC Ivory w/Cloth Seat Trim, Alloy wheels, Automatic temperature control, Distance pacing cruise control: Adaptive Cruise Control with Low-Speed Follow, Exterior Parking Camera Rear, Fully automatic headlights, Low tire pressure warning, Radio data system, Steering wheel mounted audio controls. Discover the difference. Experience the value. Honda of Lincoln. 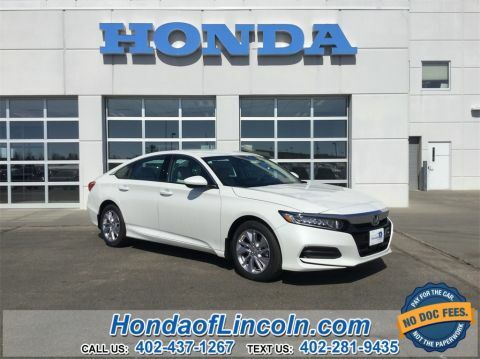 2019 Honda Accord LX FWD 1.5T I4 DOHC 16V Turbocharged VTEC Ivory w/Cloth Seat Trim, Alloy wheels, Automatic temperature control, Distance pacing cruise control: Adaptive Cruise Control with Low-Speed Follow, Exterior Parking Camera Rear, Fully automatic headlights, Illuminated entry, Low tire pressure warning, Radio: 160-Watt AM/FM Audio System, Steering wheel mounted audio controls. Discover the difference. Experience the value. Honda of Lincoln. 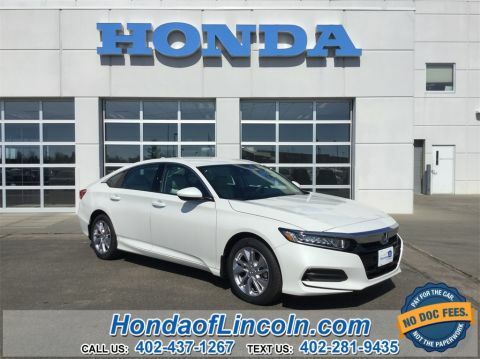 2019 Honda Accord LX FWD 1.5T I4 DOHC 16V Turbocharged VTEC Ivory w/Cloth Seat Trim, Alloy wheels, Automatic temperature control, Distance pacing cruise control: Adaptive Cruise Control with Low-Speed Follow, Exterior Parking Camera Rear, Fully automatic headlights, Low tire pressure warning, Radio: 160-Watt AM/FM Audio System, Steering wheel mounted audio controls, Traction control. Discover the difference. Experience the value. Honda of Lincoln. 2019 Honda Accord LX FWD 1.5T I4 DOHC 16V Turbocharged VTEC Black w/Cloth Seat Trim, Alloy wheels, Automatic temperature control, Distance pacing cruise control: Adaptive Cruise Control with Low-Speed Follow, Exterior Parking Camera Rear, Fully automatic headlights, Low tire pressure warning, Radio data system, Steering wheel mounted audio controls. Discover the difference. Experience the value. Honda of Lincoln. 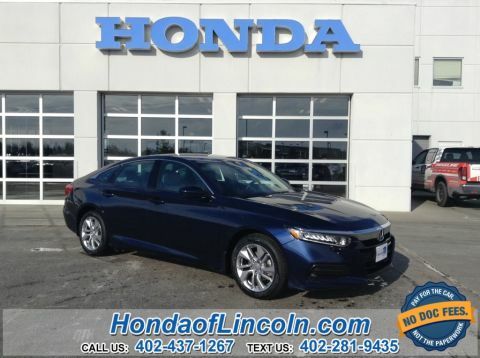 2019 Honda Accord LX FWD 1.5T I4 DOHC 16V Turbocharged VTEC Gray w/Cloth Seat Trim, Alloy wheels, Automatic temperature control, Distance pacing cruise control: Adaptive Cruise Control with Low-Speed Follow, Exterior Parking Camera Rear, Fully automatic headlights, Low tire pressure warning, Radio data system, Steering wheel mounted audio controls, Traction control. Discover the difference. Experience the value. Honda of Lincoln. 2019 Honda Accord LX FWD 1.5T I4 DOHC 16V Turbocharged VTEC Black w/Cloth Seat Trim, Alloy wheels, Automatic temperature control, Distance pacing cruise control: Adaptive Cruise Control with Low-Speed Follow, Exterior Parking Camera Rear, Fully automatic headlights, Illuminated entry, Low tire pressure warning, Radio data system, Steering wheel mounted audio controls, Traction control. Discover the difference. Experience the value. Honda of Lincoln. 2019 Honda Accord LX FWD 1.5T I4 DOHC 16V Turbocharged VTEC Ivory w/Cloth Seat Trim, Alloy wheels, Distance pacing cruise control: Adaptive Cruise Control with Low-Speed Follow, Exterior Parking Camera Rear, Fully automatic headlights, Low tire pressure warning, Radio data system, Steering wheel mounted audio controls. Discover the difference. Experience the value. Honda of Lincoln. 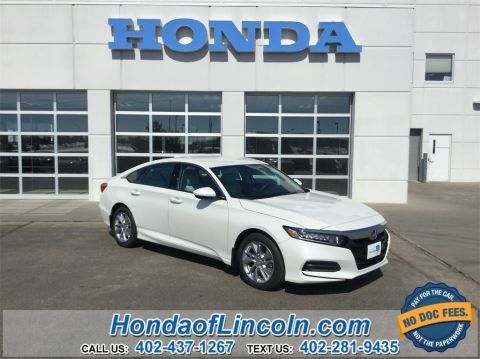 2019 Honda Accord LX FWD 1.5T I4 DOHC 16V Turbocharged VTEC Ivory w/Cloth Seat Trim, Alloy wheels, Automatic temperature control, Distance pacing cruise control: Adaptive Cruise Control with Low-Speed Follow, Exterior Parking Camera Rear, Fully automatic headlights, Illuminated entry, Low tire pressure warning, Radio data system, Steering wheel mounted audio controls. Discover the difference. Experience the value. Honda of Lincoln. 2019 Honda Accord LX FWD 1.5T I4 DOHC 16V Turbocharged VTEC Gray w/Cloth Seat Trim, Alloy wheels, Automatic temperature control, Distance pacing cruise control: Adaptive Cruise Control with Low-Speed Follow, Exterior Parking Camera Rear, Fully automatic headlights, Low tire pressure warning, Radio data system, Remote keyless entry, Steering wheel mounted audio controls. Discover the difference. Experience the value. Honda of Lincoln. 2019 Honda Accord LX FWD 1.5T I4 DOHC 16V Turbocharged VTEC Black w/Cloth Seat Trim, Alloy wheels, Automatic temperature control, Distance pacing cruise control: Adaptive Cruise Control with Low-Speed Follow, Exterior Parking Camera Rear, Fully automatic headlights, Low tire pressure warning, Radio data system, Steering wheel mounted audio controls, Traction control. Discover the difference. Experience the value. Honda of Lincoln.